Orioles second baseman Jonathan Schoop throws to first base for a double play after forcing out David Ortiz. Although taking two of three from the Baltimore Orioles wasn’t nearly as uplifting as winning the World Series, it still felt pretty darn good. 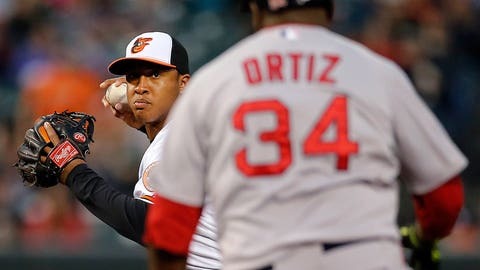 Felix Doubront and four relievers combined kept Baltimore’s potent lineup in check, and David Ortiz had three of Boston’s 12 hits off Wei-Yin Chen in a 4-3 victory Thursday night. Xander Bogaerts also had three hits for the defending champions. The 21-year-old shortstop has reached in eight of 12 plate appearances, collecting five hits and three walks. Boston finished with 14 hits, 12 of them singles. The Red Sox amassed 33 hits in the three games, including five by Ortiz, but even more impressive was that Boston limited the Orioles to seven runs over 27 innings. "That’s why they were the last team standing last year," Baltimore manager Buck Showalter said. "They pitched better than everybody else for the most part, and I don’t think I’m telling anybody anything they don’t know. You pitch real well, you’ve got a chance to play extra games at the end of the year." Doubront (1-0) allowed two runs and six hits in 5 2-3 innings, and Boston’s bullpen maintained its 0.00 ERA with 3 1-3 innings of three-hit relief. Chris Capuano got three straight outs in the seventh, Junichi Tazawa worked the eighth and Koji Uehara needed only seven pitches to retire the side in the ninth for his first save. Boston’s bullpen allowed six hits over 7 1-3 innings in the series. "That’s going to be critical until we get to the point where we can push the starters a little bit more, or until their efficiency continues to climb," Red Sox manager John Farrell said. All told, there wasn’t much to complain about. Boston’s only loss in the series was in the opener, a 2-1 decision. "If you can start the season winning a series, that’s what you want to do," third baseman Will Middlebrooks said. "Especially with a team like Baltimore, as good as they are and the staff they have. We’re pretty happy with it." Bogaerts added, "I’m really happy the way things are going so far. We lost the first one, but we came right back and won the next two." Matt Wieters had three hits for the Orioles and Chris Davis had two hits and scored twice, but it wasn’t enough to win the deciding game of the series. "They threw well against us in three games, but you know, luckily it’s a long season," shortstop J.J. Hardy said. "We’ll see them again." Chen (0-1) gave up four runs in 5 2-3 innings. The left-hander yielded 11 singles, one double and did not issue a walk. He left in the sixth after Middlebrooks doubled and scored on a two-out single by Jackie Bradley Jr. to put Boston ahead 4-2. "I allowed a lot of hits. That’s what I have to work on," Chen said through an interpreter. "I didn’t allow a big inning. That’s what I’m happy about." Baltimore chased Doubront in the bottom of the sixth. Davis singled, took third on a single by Wieters and scored on a wild pitch by Brandon Workman. Chen gave up singles to four of the first six batters he faced but got a pair of double plays to avoid extensive damage. After Boston put runners on the corners and no outs in the second inning, Bogaerts scored on a double-play grounder. The Red Sox made it 2-0 in the third. With two outs, Bradley scored from first base when a bloop single by Ortiz eluded the grasp of a diving Nelson Cruz. Three singles, the last by David Ross, put Boston up 3-0 in the fourth. The Orioles scored two in the bottom half on doubles by Davis and Wieters, along with an RBI single by Delmon Young.